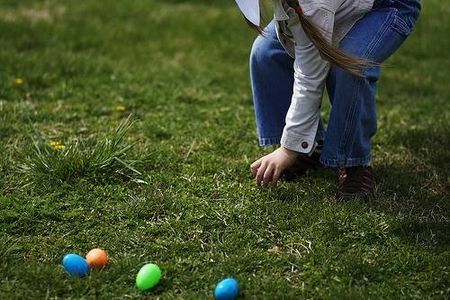 In my latest “In Good Faith” column I talk about why I love Easter Egg hunts and lament that I’m no longer allowed to “compete” against four and five-year-olds. A blessed Easter to everyone! Most kids can’t imagine Easter Day without an Easter egg hunt. Whether it’s in the backyard organized by the older cousins or in a neighborhood park set up by parents, the reward is sweet. I used to love the adrenaline-pumping thrill of the hunt. And that was just last year. Actually we do hold an annual Easter egg hunt at my church following Easter services and while I’ve always thought its start resembled the Running of the Bulls at Pamplona, to my knowledge there have never been any egg-related injuries. A few parents organize the hunt on the front lawn of the church with help from some eager teens – which means I occasionally stumble upon unfound eggs in mid-August. There’s no better reminder of the resurrection than encountering a gooey four-month old melted mixture of chocolate bunny and purple jelly beans inside a plastic egg. I know that in some religious circles Easter egg hunts are anathema – something about being pagan in origin. And, yes, the egg as a symbol of rebirth and new life pre-dates Christianity. But I like Easter egg hunts and not just because free jelly beans are the best kind. I love watching a young child’s face light up with the thrill of discovery – nothing beats it. And that thrill of discovery was precisely what took place on that first Easter morning. No, I’m not comparing Jesus’ resurrection to an Easter egg hunt but there is something wonderfully exhilarating about the moment of discovery. The disciples experienced it when they came upon the empty tomb and children experience it when they find an egg. The hope is that kids will find that same feeling of faithful discovery as they mature and move ever deeper into relationship with God. The original “Aha moment” that took place over 2,000 years ago forever changed the world by proving that hope and faith and life conquer sin and death and the grave. We discover that out of darkness is light, out of pain is joy, out of death is life. This is the miracle of Easter; the reason we even bother with egg hunts and fancy hats and celebratory feasts and Peeps. You could say that the disciples’ discovery of the empty tomb is inversely proportional to the disappointment of biting into an empty chocolate egg. Okay, that’s a dreadful analogy as one leads to new life while the other simply brings a return trip to the Easter basket. But this year I encourage you to think about the thrill of discovery on that first Easter morning. I guarantee that placing your celebration into a more spiritual context will make that Cadbury egg taste even sweeter.